On a recent episode of Mac Power Users, Katie Floyd and David Sparks discussed their favorite iOS utilities — simple little apps that do one thing really well. I thought I’d follow in their footsteps and publish a list of, what I consider to be, the best iOS utilities available. 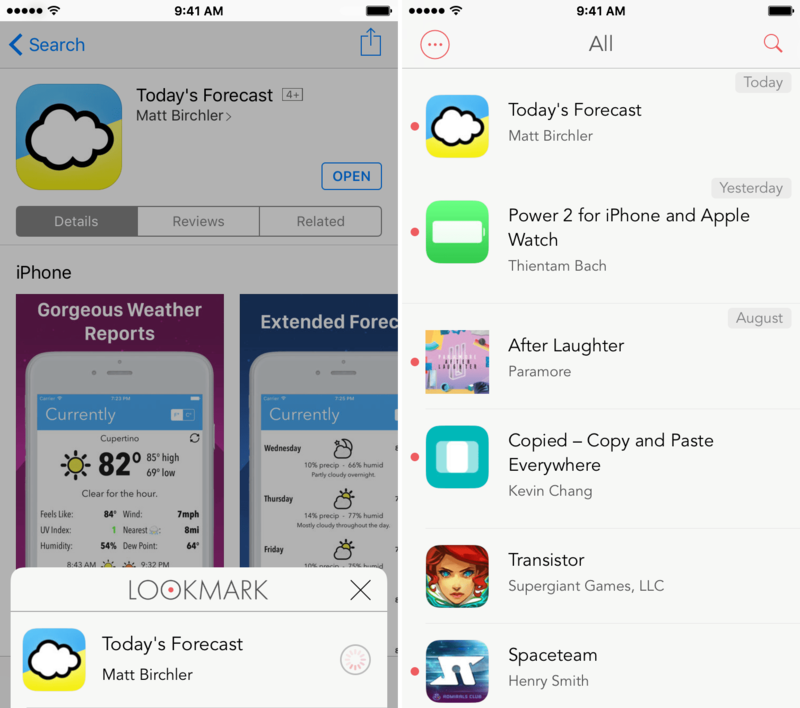 Lookmark: A brilliant little utility from Heybox AB that let’s you save iTunes content for later. It has support for audiobooks, iBooks, iOS apps, Mac apps, movies, music, podcasts, and TV shows. Just use the app’s share extension to save content from within iTunes, the App Store, Safari, or just about any other application where you’d find a link to one of the supported media types. And with a Lookmark Plus subscription, you can even get notifications of price drops on your bookmarked media. Deliveries: A package tracking application from Junecloud that helps you stay on top of your deliveries. It supports UPS, FedEx, US Postal Service, DHL, Amazon, and just about any other package delivery service you can think of. Deliveries also includes a Today View widget and an Apple Watch app that allows you to check the status of your deliveries with just a glance. 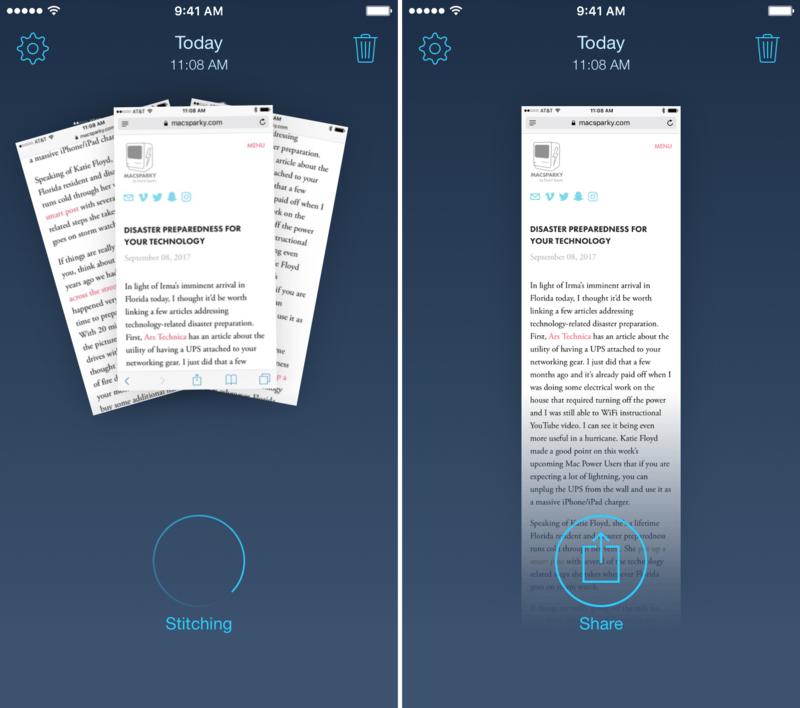 Transmit: The best FTP client on iOS is developed by the fine folks at Panic. It supports FTP, SFTP, S3, DreamObjects, and WebDAV. It features in-app drag and drop for quick file transfers and works well with the system’s document picker to receive or send files from within other applications. PCalc: A powerful calculator app by TLA Systems which features a Today View widget, Apple Watch support, and several theme options. This is the calculator I use when my wife and I are out grocery shopping — the Watch implementation is superb. GIPHY: An application that helps you find and share the perfect GIF for every situation. You can launch the app directly and use the application’s built-in sharing features or use the iMessage app to keep yourself within the context of the conversation. Tailor: A brilliant little utility from Foundry 63 that automatically stitches multiple screenshots together into a single image. It works with iMessage, Safari, Tweetbot, Google Maps, and more. Better: This is currently my ad blocker of choice. The app is made by Ind.ie and focuses on blocking trackers and behavioral advertising rather than attempting to remove all ads from your web browsing experience. Screens: A remote desktop and VNC client from Edovia that allows you to quickly and securely control your Mac, PC, or Linux machine from your iOS device. I use Screens to help my mother-in-law with her iMac and manage my Mac Mini server, it’s one of the key pieces of software that has allowed me to go, nearly, iOS-only. Countdowns: A simple little app from Stephen Hayes that let’s you place countdowns to important dates in your iOS device’s Today View. Unobstruct: A brilliant content blocker from InfinitApps that automatically removes floating social toolbars and other unnecessary cruft from many popular websites. The app also includes an action extension to remove these elements from any other webpage, on-demand. The web is a much nicer place to be with this app enabled. Linky: A simple little share extension from Pragmatic Code that let’s you post webpage links and images to Twitter and Facebook. When sharing a web page, it can suggest images to include in your post and it can create text shots from selected text automatically. CornerTube: YouTube for iPad still lacks support for picture-in-picture and a little app from Tiny Whale can fill the gap for you. The app features a Today View widget, an action extension, and in-app search allowing you to get the video you want into picture-in-picture with little interruption to your workflow. LongScreen: Similar to Tailor, Shing Cheong Cheung’s LongScreen can combine multiple screenshots into a single image. It can even clean up the screenshot’s status bar and overlay it within an image of the appropriate Apple device. Omnistat: A system status and activity monitor app from Matthieu Bolard that allows you to view battery life, free space, CPU, and memory usage from the application’s Today View widgets. I use the battery life widget on my iPad, which let’s me have quick access to my current battery life without having to clutter the system status bar. Terminology: The best dictionary and thesaurus app I’ve found for iOS. It’s made by Agile Tortoise and can be used by launching the app directly or through its share extension, after highlighting a word from within another application. 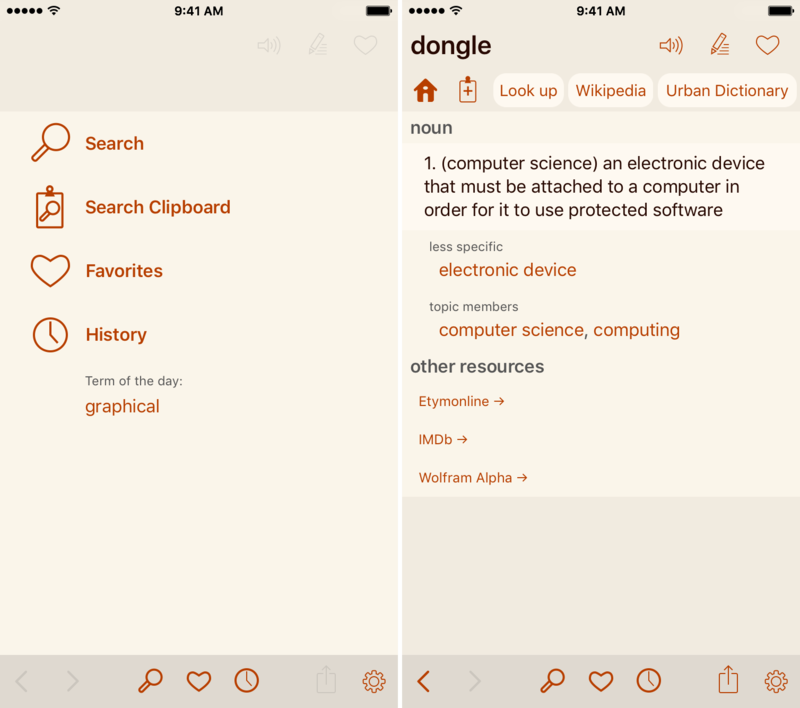 In addition to the app’s built in dictionary and thesaurus, it has support for searching Google, Wikipedia, and Wolfram Alpha. 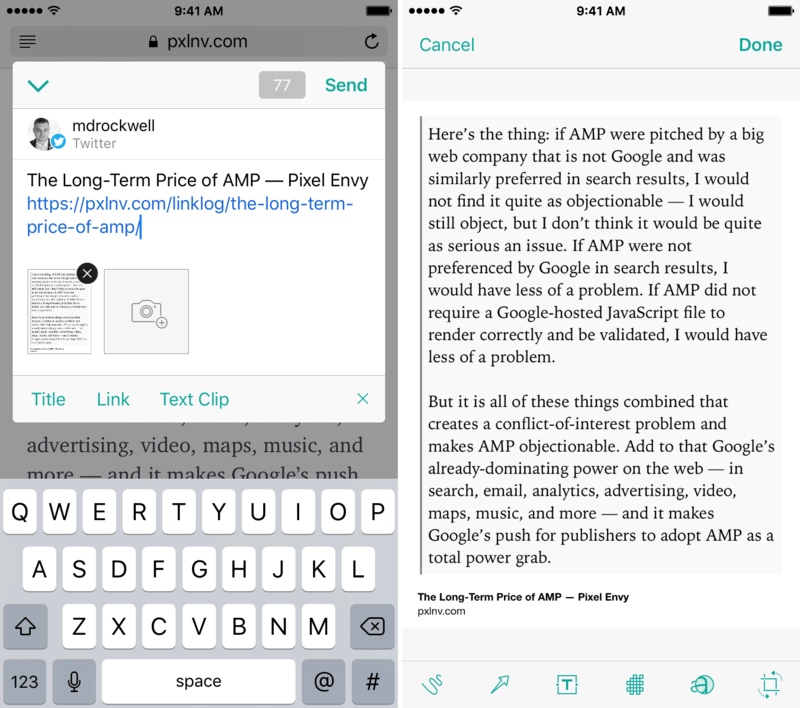 You can even add your own sources with the app’s custom actions feature. Feed Hawk: A utility app from Golden Hill Software that does one thing really well — it allows you to quickly subscribe to website RSS feeds through the application’s share extension. It supports Feed Wrangler, Feedbin, FeedHQ, and several other popular RSS services. Pocket Scale: A simple weight tracking app by Uptown Apps. Pocket Scale saves your weigh-ins to the Health app and can send you reminder notifications to input your current weight. White Noise Pro: A white noise app from TMSOFT that features a catalog of fifty sounds — from box fans to rain storms and everything in between. It’s great for helping you fall asleep at night or to block out distractions when you’re trying to focus on your work. 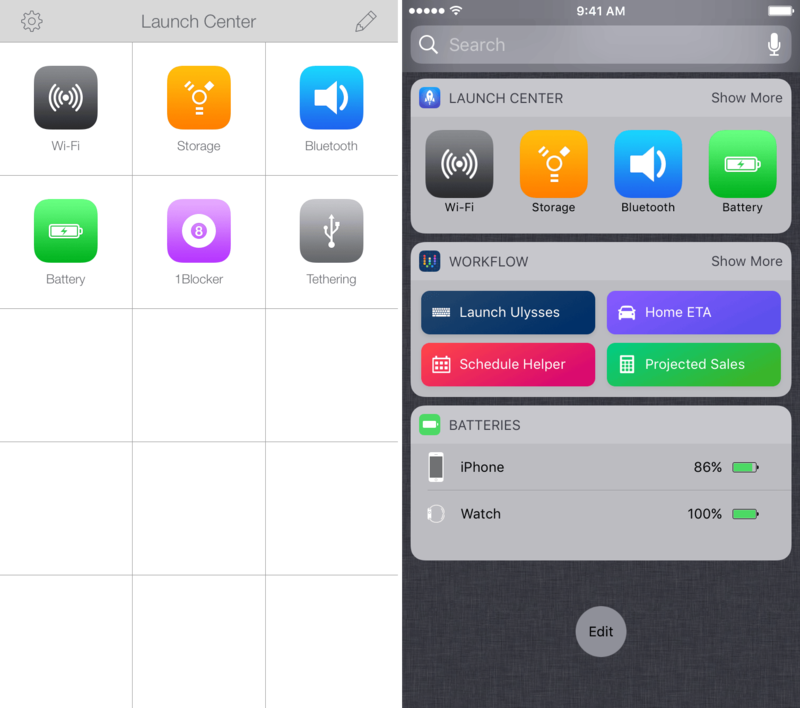 Launch Center Pro: My favorite launcher application for iOS. The app is developed by Contrast and gives you quick access to the tasks you do most. I’ve set it up so that I have shortcuts to my Wi-Fi, storage, Bluetooth, and battery Settings from the application’s widget, but it’s fully customizable to fit your needs. View Source: An application by Paul Hudson that let’s you view the HTML source code of any webpage in Safari by activating the application’s action extension. Associate: A simple utility from Squibner that helps you build affiliate links to Amazon with your Amazon Associates account. Use it while browsing Amazon’s website with Associate’s action extension or search for products from the app itself. Blink: Another app from Squibner, this one let’s you quickly build iTunes affiliate links for apps, TV shows, movies, music, or books.